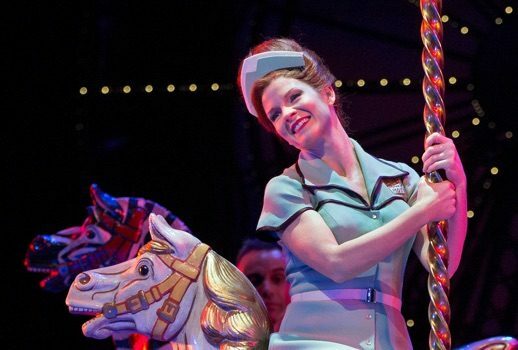 I’m sure I’m not the first to say it, but thank God for Kelli O’Hara. At this point the Broadway veteran and Lincoln Center darling is becoming a national treasure. And as Despina in the Metropolitan Opera’s new production of Così fan tutte, she makes her case, injecting much needed vitality into an otherwise lethargic evening. This was no easy accomplishment; O’Hara had her work cut out for her, working against a largely predictable production—set in 1950s Coney Island—and a cast that seemed to have taken a dose of Xanax before the curtain went up. Indeed, Ms. O’Hara’s most significant hurdle was her colleagues on stage, with whom she tried to engage and interact, but to no avail. Serena Malfi’s Dorabella and Amanda Majeski’s Fiordiligi foiled her at every turn. In fact, Majeski gave one of the dullest performances I have ever seen. Her “Come scoglio…” was as compelling as a high school nerd delivering a book report: awkward, quiet, and tedious. It would be one thing had she turned her fugitive energy inward, sublimating it for high-octane, virtuosic singing. But, she did not. She went out of tune; her coloratura was messy; her sound was colorless and thin. Malfi did only slightly better. Her mezzo-soprano is a lovely instrument: very precise, with a dark, warm color; she is also capable of graceful legato. But like Majeski, she too lacked passion for the material; she was dead behind the eyes; there was no urgency. David Robertson’s prudish conducting only exacerbated this inertia. His interpretation felt more studied than performed. This was most evident during the overture, which was coupled with a dumb show for laughs. Ben Bliss and Adam Plachetka had an easier time of it as Ferrando and Guglielmo. To begin with, they seemed more at ease on stage, animating their characters (who could easily be read as creepy, toxic strains of dominating masculinity) with carefree gusto. Vocally, Ben Bliss was a standout. His honeyed tenor moved easily through the difficult role’s higher reaches. Christopher Maltman offered a rather generic Don Alfonso. He was inoffensive and vocally competent, but it also felt a bit like he was phoning it in. It would have been nice to see him plumb the darker, more cynical depths of Alfonso, whose moral and sexual philosophy has a sadistic edge. Instead, Maltman was jolly and affable, carousing through the motions superficially. And while it may be argued that the director might have instructed him to take this approach, his performance was a wasted opportunity. Indeed, Ms. O’Hara contrasted sharply with these singers. Her presence jostled one from the torpor of the evening’s ennui. A jolt, like a shot of espresso. The woman clearly knows how to handle herself on stage, even in a house as big as the Met. Moreover, her clear, vibrant soprano filled the space more effectively than her colleagues, proving her technique’s mettle. Phelim McDermott’s production, set in the slightly seedy heyday of Coney Island, felt a bit exploitive. Central to his mise-en-scène was a pack of scampering sideshow performers, each getting their chance to display a particular talent. I’d be more inclined to forgive the tone-deaf, abelist gloss to such dubious cultural history if the effect had been artful, or even entertaining. It was neither. The one stroke of intelligence was really not all that perceptive or creative. It came in the notion of setting the opera in the 1950s, right on the cusp of the sexual and political revolutions that would fragment America in the years to come. In this context, Despina’s advice to Dorabella and Fiordiligi indicated towards a nascent, feminist liberation—the ability to change one’s mind indicates a certain measure of freedom and agency. Indeed, the years following World War II are a wise period in which to contextualize Da Ponte’s text, which, on its own terms seems to participate in Enlightenment hysteria regarding Cartesian dualism. Such concerns weave through the political and cultural events of the 50s as well, including paranoia toward (among other things) uncontrolled, female sexuality. 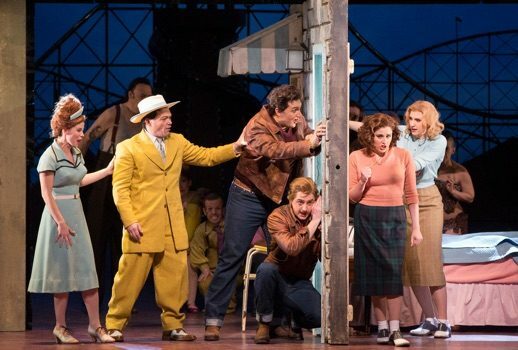 The sets by Tom Pye and the costumes by Laura Hopkins evoked the time period perfectly—a pastel color pallet, flying seagulls, white starched sailor uniforms, ice cream stands and neon-lit motels. And in the background, a starlit Ferris Wheel. A majestic roller coaster against a violet background—nostalgia lovingly cultivated, but with no effort at subversion. Così fan tutte is an opera I wrestle with ideologically. Two soldiers testing the fidelity of their lovers, only to discover their inconstancy. It seems a bit dated in the time of #metoo and #timesup. Our current cultural dilemmas require a version of this opera with a bit more bite. Something a bit messier. A tireless excavation of all the text has to offer. Instead, arguably, the most prominent company in the world has decided to play it safe yet again. The approach is all good intentions, but no revelation. Well… thank God for Kelli O’Hara.